Donations to SEWASP are a great investment and are used very responsibly. SEWASP does a great deal with a relatively modest budget. We do not have any high paid executives or even any paid staff. We are a community non-profit organization staffed by volunteers. 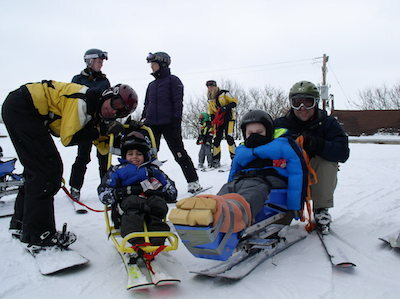 Therefore, with the exception of a small fundraising/marketing budget, all donations go towards the costs related to getting participants out on the hill for adaptive ski and snowboard lessons. Additionally, the more generous you are with your donations, the more lessons we can fund and the more time our volunteers have to be out teaching those lessons instead of soliciting donations. You can help share the thrill of alpine skiing and snowboarding with people of all abilities through your tax deductable donations and volunteering. Donating time through volunteering is another great way to contribute to SEWASP. SEWASP is a not-for-profit 501c(3) non-stock corporation licensed in Wisconsin as a charitable organization. Donations are tax deductible as allowed by law. We rely on contributions to support all functions of our ski school. Our mission is carried out with an all-volunteer board of directors and volunteer ski/snowboard instructors. Please remember that reservations are always required for SEWASP lessons. Copyright © 2005 - 2019 SEWASP.